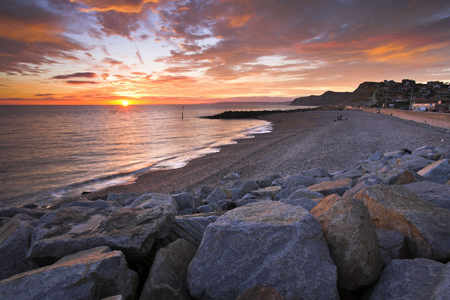 With the stunning golden glow of the majestic sandstone cliffs and the shimmering radiance of Golden Cap West Bay is situated at the western end of Chesil Beach and forms part of the Jurassic Coast . West Bay is a wonderful seaside location for coast and countryside walks, fossil hunting, fishing, scuba diving, paragliding, golfing, and river boating. The Dorset historic market town of Bridport lies one and a half miles inland from the West Bay coast.